Be the first to share your favorite memory, photo or story of A. H.. This memorial page is dedicated for family, friends and future generations to celebrate the life of their loved one. A. H. “Sonny” Rupp, age 90, went home to be with his Lord on Thursday, March 8, 2018, with his family by his side. Sonny was born on June 24th, 1927, to Rudolph & Millie Rupp in Perry, Oklahoma, where he grew up with his siblings, Marjie Rupp Voise, Dorothy Rupp Foster, Donald Rupp & Clinton Rupp. Sonny graduated from Sumner School and was a lifelong Farmer / Rancher. During the offseason, he worked for the Oklahoma Department of Transportation mowing along the highways using his own tractor and mower. During winter periods he would also weld for the Charles Machine Works, Inc. during the early days of its existence. 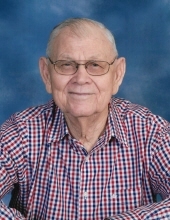 He was a Founding Board Member of the Morr Rural Water Cooperative, served on the Sumner School Board along with multiple terms as a church council member for the Zion Lutheran Church. Farming and ranching for over forty years, he took great pride in his work. His true passion was always working outdoors. On May 12th, 1950, he married Mary Lue Durbin and their first home was RR#3, Sumner R., Perry, OK. They were blessed with 4 children, 2 girls, and 2 boys, Becky, Teresa, Randy & Russ. He was baptized, confirmed and a dedicated member of Zion Lutheran Church of Perry for his entire life. That church was a second home to Mom, Dad, and to the children. When they were small, he made them a complete playground with monkey bars, a swing set and a merry-go-round out of old automobile parts and metal tractor seats, and a go-cart which they wore the wheels off of. The merry-go-round is still around and being enjoyed by great-grandchildren 60 years later. They raised cattle, pigs, chickens & even some horses. Everyone enjoyed coming to Uncle Sonny & Aunt Mary’s house. When he found free time, he loved to go dancing with his wife. Sonny loved woodworking & after he slowed down his farming activities, he began making wooden toys for his grandchildren and many “small friends” he met on his visits to the local Donut Shop. People around town knew him for his wooden toys. He made cars, tractors, pickups, trailers, plows, fences, animals, feeders, Ditch Witch Trenchers, Nativity scenes, doll beds, doll benches, crosses & wooden trains. During his farming days, he designed and built all of his barns and sheds, as well as other equipment, such as multiple stock trailers, lawn mower trailers and all the beds for his pickups and wheat trucks. He even built a patio for the farmhouse on the Red Rock Road. Sonny trained dozens of young men to do farm work, where several of those men later have said he was the most patient boss they ever had. He loved to take family vacations and taught his children to love travel. Even during lean years, he would find ways to take a family vacation. He bragged that one year he took the family on vacation for $68. Sonny was a natural athlete and loved sports. He was an accomplished basketball and baseball player but his true success came as a home run champion during his days playing in the Perry area Slow pitch softball Church league. He was proceeded in death by his father Rudolph Rupp, his mother Millie Rupp, his sister Dorothy Foster of Albuquerque, NM, his brother Donald Rupp of Perry, OK and his beloved wife Mary Lue Rupp. He is survived by his sister Marjie Voise of Perry, OK, his brother Clinton Rupp and his wife Carolyn of Surprise, AZ, his daughter Becky Krieg and her husband Larry of Tulsa, OK, his daughter, Teresa Snyder of Perry, OK, his son Randy Rupp and his wife Cindy of Perry, OK, his son Russ Rupp and his wife Carlene of Edmond, OK, as well as his grandchildren: Dylan Krieg his wife Tiffany and their children Gage and Evelyn of Frisco, TX, Brett Krieg his wife Ashley and their daughters Avery and Anna of Broken Arrow, OK, Evan Snyder of Atglen, PA, Lacey Carson her husband Josh and their sons Whelan and Wyatt of Perry, OK, Lyndee Strader and her husband Byrum of Perry, OK, Jake Rupp, Zack Rupp, and Joe Rupp of Perry, OK, Austin Rupp, Parker Rupp, and Sunny Fei Rupp of Edmond, OK. Viewing will be Tuesday, March 13, from 8am-8pm at Trout Funeral Home of Perry, with a time of family gathering Tuesday evening from 6-8pm. A celebration to gratefully remember Sonny’s life will be held at 2:00 pm, Wednesday, March 14, 2018, at Zion Lutheran Church, with Pastors Dan Thimell and Peter Olson officiating, with burial to follow at Zion Lutheran Cemetery. To send flowers or a remembrance gift to the family of A. H. "Sonny" Rupp, please visit our Tribute Store. The family would like to visit with friends from 6:00 p.m. to 8:00 p.m. on Tuesday evening at the funeral home. "Email Address" would like to share the life celebration of A. H. "Sonny" Rupp. Click on the "link" to go to share a favorite memory or leave a condolence message for the family.